Calling All Secret Shoppers - We Need You! Here at Woolley's, we love wine! So much so, that we have two entire evenings every week dedicated to Wine Lovers. (Every Sunday and Wednesday night you get half off any bottle in our extensive collection with your dinner). Additionally, we take meticulous pride in our list and were awarded Wine Spectator's Award of Excellence and Wine Enthusiast's Award of Distinction as well. 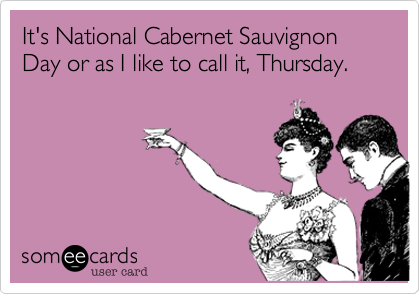 And if that wasn't enough, we get to celebrate National Cabernet Day this week too. On Thursday, August 30, we'll be celebrating all things Cabernet by offering guests half off bottles of any Cabernet Sauvignon or Cabernet Franc on our list ALL day! So, come on in tomorrow and enjoy half off any bottle of Cabernet in our award winning collection. Happy Cabernet Day & Happy Thursday, friends! We're pretty excited by how well our garden's taken off, and we've sure taken to it as well. From incorporating our garden fresh produce into our Weekly Lunch Specials to supplementing our farmer's market finds, our garden has served us well this season. When we started our little kitchen garden out back in May, it was full of promise. In June, it was growing well, despite the rabbits attempts at dining at Woolley's. Now, just three months later, it's lived up to all of its potential and we're so thrilled to be able to share our garden's bounty with all of our guests. This week, our lunch specials included a Bacon, Lettuce, and Fried Green Tomato Sandwich, and guess where the tomatoes came from. If you guessed our garden, you were right on the money! A few weeks ago, we were even able to use Smith Farms' grilled zucchini with our garden fresh cucumbers in a delicious Farm Fresh Salad lunch special. We're also pretty excited about our indoor herb garden. We can use fresh herbs even during those long Minnesota winters. This whole green thumb thing is working out nicely. How about you? Do you have a backyard garden or maybe even a kitchen herb garden? What's your favorite way to use your garden's bounty? Please join us in congratulating our latest Employee of the Week, Grandma Sue! With over a decade of service under her belt, Grandma is a long-time Woolley's veteran and boasts her own share of regulars that come, not for just our wonderful steaks, but to see her as well. As a server at Woolley's, Grandma Sue consistently goes out of her way to make sure her guests have not just a great meal, but a wonderful experience. Ensuring that any event they might be celebrating is noticed and properly acknowledging, remembering preferences from previous visits, and even working with kitchen staff to accommodate special requests, Grandma is an asset to our team. A multiple-time recognized Diamond Award Finalist and even a grand prize Diamond Award Winner for Server, Grandma Sue is a jewel in our team. Please join us in congratulating her when you stop in, or even just extending a nice high-five when you see her. Keep up the good work, Grandma! Throughout the month of August, Woolley's is looking for secret shoppers to help us improve our guest experience! It's simple if you want to participate, and you even get a free meal out of it. Simply let us know you're interested, and we'll send you a certificate for lunch, dinner, The Corner Bar, or brunch along with a secret shopper form and a postage paid envelope. Then, you use your certificate to enjoy the meal specified. (Lunch, Bar, and Brunch certificates are all good for $25, while dinner is good for $40). Once your experience is complete, we simply ask you to complete the enclosed secret shopper form and return it to us using the enclosed postage paid envelope. Simple, right? Plus, we get to use all of the great feedback we get to improve the guest experience at Woolley's, so you always can expect a great meal and exemplary service. If you think you'd like to be a secret shopper - Great! Either e-mail us at a-r@tricitymanagement.com or call us at 952-854-1010, mentioning that you saw this post and you'd like to help us out.